Kolten Parker writes that “She’s proof that big ideas pay off. 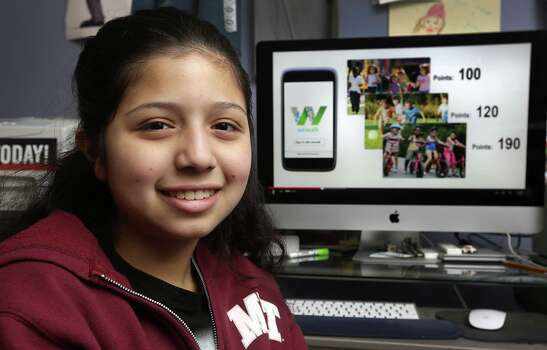 Estrella Hernandez, a 13-year-old Alamo Heights Junior School student, put her imagination to good use when designing “We Walk” a smartphone app made to help fight childhood obesity while incorporating San Antonio’s “rich history” and community. “It was this odd feeling of disbelief that something I thought of in my room in sixth grade is actually becoming a reality,” Hernandez said. The eighth-grade student has received $12,000 through community grants and sponsorships to develop a beta version of her Alamo City-based app and hopes to pull in about $200,000 to finish developing it. Posted on February 1, 2014, in Uncategorized and tagged Alamo Heights Junior School, app, Estrella Hernandez, fitness, games and fitness, Games and Learning, kids and game development, teen develops app, teen programers, We Walk. Bookmark the permalink. Leave a comment.